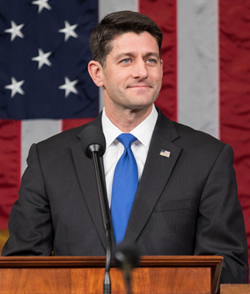 Speaker of the House Paul Ryan has promised to bring two different immigration bills to the floor for a vote in the House sometime next week. Ryan’s decision to hold a vote on the two bills came as a discharge petition was just two signatures shy of having the sufficient amount needed to force a vote on four different immigration bills in the House. “We have a process that all of our members have agreed to, which brings these bills to the floor, and that means we don’t do a discharge petition and we bring these bills to the floor,” he said in a House Republican news conference on Wednesday. One of the bills will be Bob Goodlatte's (R-VA) Securing America's Future act. The Securing America’s Future Act includes elimination of the diversity visa lottery and sanctuary cities, strengthened interior immigration enforcement measures, increased funding for border security, and the extension of the benefits of DACA to its current recipients(~700,000) to be renewed every three years. The Securing America's Future Act also increases family-based migration eligibility requirements and lowers future levels of legal immigration by about 40% or 400,000 people per year. Adjusting and decreasing family based immigration is highly controversial and drastically lowering legal immigration levels during a time like now with high economic growth and low unemployment would be economically disadvantageous. These two policies haven been met with significant Democratic and Republican opposition in the past and will likely inhibit the bill’s chance to pass. We do not know what the second immigration bill that the House will vote on next week looks like yet, but according to Speaker Ryan it will represent a compromise among Republicans in the House that might just recieve enough support from lawmakers to pass. “There are members who wanted to have a vote on the Goodlatte-McCaul bill, they’re going to get that. And then we now have a bill that represents a compromise that is going to be brought to the floor so members can actually vote on legislation tackling this issue, and this has a chance of going into law…this represents a consensus between our members so that we can move forward on the immigration issue,” he said. If Republicans bring a bill to the floor next week that simply provides unauthorized immigrants brought to the US as minors with a path to earn legal status and includes adequate border security funding, without trying to include more controversial measures that has deterred legislative progress in the past, it will have a decent change of actually becoming law. Something similar to Will Hurd's (R-TX) Uniting and Securing America (USA) Act has the best chance of passing because it is a simple, bipartisan choice in the best interest of Americans. The USA Act includes provisions to provide ~1,800,000 DREAMers with a path to earn legal status, adequately fund effective border security, cut down on catch and release by hiring more immigration judges to reduce delays in immigration courts, and address the factors in Central America driving illegal immigration to the United States. It is important to remember that any bill that is adopted by the House will also have to pass the Senate and be signed by President Donald Trump in order to become law. Republican leaders in the House believe they can bring something to the floor next week that will garner enough support from lawmakers to make it through the legislative process.